In the late 1990s, it was common for companies to spend $50,000 to $150,000 for a Flash homepage that looked like a beautiful brochure. However, they soon learned that Flash was cumbersome, slow to load, expensive to build, and hard to update, and moved on to HTML. Now only specialized, high-end sites are Flash only. The exact same thing has replayed itself on the iPhone. Companies have paid $50,000, $100,000, and more for an iPhone app. Now they have to keep the iPhone app in sync with their regular web site, and have to add additional native apps, each at a high price point, due to the hypergrowth of Android and newly viable platforms like Windows Phone 7. Banks and airlines, commonly known as technology laggards, are well ahead of the rest of the industry when it comes to mobile access to their systems. Banks and airlines are deploying highly functional, HTML5 mobile optimized websites that offer a high level of functionality relative to their full-fledged websites and existing iPhone apps. What is it that banks and airlines have figured out that Silicon Valley startups with their focus on native Apps have not figured out? Compare the banks and airline mobile experience to that of the top digital agencies, many of which are still obsessed with Flash home pages and have sites that render incorrectly if at all on mobile handsets. This was first pointed out in a hilarious post by Nick Jones in August with screenshots of the top digital agencies, most of which do not render at all on a mobile browser, and then followed up. 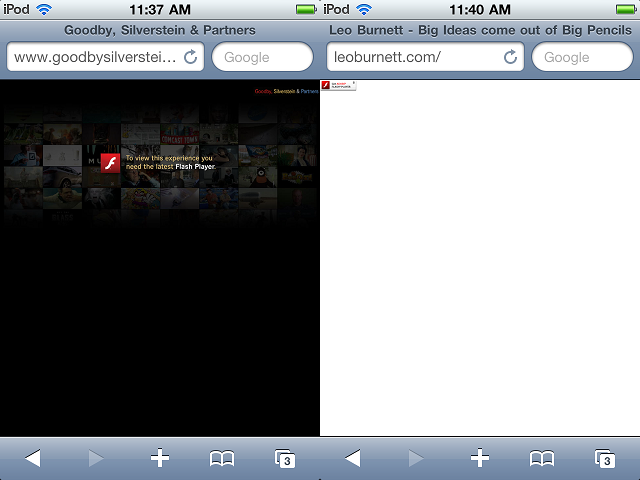 AdAge followed up with an article in September about the World’s Worst Agency Websites for iPhone and iPads. Even at my company Webtrends, with a powerful mobile analytics solution, and recently acquired mobile apps technology, our website renders well on a mobile phone but we are still in the process of optimizing the content so that it easier to navigate. The digerati in Silicon Valley have been arguing ad infinitum about the merits of native vs. HTML mobile apps. Businesses have now picked a winner, given the prohibitive cost of multiple native apps, and the features of an average business app which can be amply supported with mobile HTML5 browsers, which even include GPS. Carol Steinberg, SVP of E-Commerce for NBC summed it perfectly: “We’re really keen on ROI and making sure what we’re investing in the mobile platform is a worthwhile and good investment. I am just starting to feel that HTML5 will be able to give us the functions we need on our m-commerce site versus app development for the iPhone and Android, which means three platforms we have to maintain and upgrade.” Even , Bob Muglia, Microsoft’s President of Servers and Tools, recently stated that “HTML is the only true cross-platform solution for everything, including (Apple’s) iOS platform”. There will always be a place for native apps — particularly in communications, gaming, graphics intensive applications — and for the interim they’re an efficient mechanism to process payments until phones are updated with better payment systems. Some businesses may still continue to deploy native apps on one or two platforms that have some additional features. An increasingly popular and almost indistinguishable method of creating a content-oriented app is to wrap a native shell around a browser showing a HTML5 mobile optimized site using technologies like PhoneGap. Overall native apps have run their course. They get lost in the app store and are hard to find, requiring businesses to post “Available on the App Store” icons on their homepages, where they could just as easily post a “SMS this site to your phone”. Even with over 6 billion apps downloaded, research has shown that most of these are ignored or disposed, and users are only running on average 4-6 apps each, most of which use very native features like communications and the camera.Important apps like maps and Facebook are considered core to the device and are even built in to feature phones nowadays. The smartphones of today are fundamentally no different from a computer. Smartphones have browsers, applications, decent screen resolution, and a lot of processing power and RAM. When you use your notebook computer and want to check if your flight is on time, do you download the United Airlines computer application, install it, and then lookup your flight? No, because it’s not 1995. You use your browser.The browser is not as functional as a Windows or Mac OS application, but it gets the job done. You don’t have to deal with installing anything and remembering where you put an icon on your desktop. As more and more business mobile optimize their websites, downloading an app in order access businesses is going to seem archaic. Peter Yared is the vice president and general manager of Webtrend Apps, a platform used to engage customers on Facebook, iPhone and Android. He came to Webtrends via the acquisition of Transpond, a social and mobile marketing company he founded in 2007.